Taking a selfie before take-off. Seoul, here I come! Hello everyone, Annyeonghaseyo! That means “Hello,” in Korean! My name is Anna Nguyen, a Junior Marketing Major at Drexel. I will be blogging about my entire exchange experience in Seoul, South Korea at Seoul National University this Spring 2016! 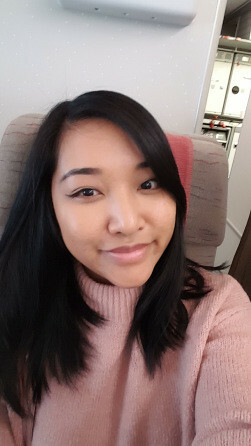 For my very first blog post here on the Drexel Study Abroad Student Blog, I thought it would be a good idea to first introduce myself before diving straight into sharing my adventures in Seoul — I just thought it would feel a bit strange in your perspective, reading about a stranger’s story without getting to know them a bit first. All great stories have to have an interesting beginning, don’t they? Well, although my beginning may not be that great, it still is very significant, as all stories are. So, why Korea? Why not the more popular destinations that students usually choose to study abroad, like the UK, France, or Spain? Here’s my answer: I’ve been obsessed with Korean culture ever since the 7th grade, after watching the Korean drama “Full House” starring Bi Rain and Song Hye Kyo with my mom at 12 years old. I was fascinated with the language, the culture, and the lifestyle, and unbeknownst to me that fascination developed into obsession over the years and now, I’d describe it as a passion. As a young adult discovering my identity at that time, I even went through a bit of an identity crisis because of my passion for Korean culture, but that’s a story for another day. As I watched more Korean dramas and listened to Korean pop music (Kpop), I began self-learning Korean and would practice my newfound skills at the local H-Mart; reading the signs (but not knowing what they meant), and ordering food in Korean. It never occurred to me that I’ve been self-learning Korean for a very long time, since I am now 22 years old, it would be 10 years. Because most of it was self-taught and not learned in a formal environment, my fluency skill is not that high. I did take some courses at Drexel beginning with the 103 level, and learning with Oh Sun Mi songsaengnim (teacher) really filled in all of the learning gaps that resulted from my self-learning. So now that you have some background info about my passion for the Korean language and culture, you’d understand what I mean when I say, visiting Korea has always been a life-long dream of mine. I never thought it would happen this soon as I’m still in college, but if not now, then when? Drexel Study Abroad is giving me the opportunity to make my dream a reality before I graduate, work full time and have no time to travel. So I decided to take that chance and turned it into an application, and then a non-stop plane ticket to Seoul. And now that I’m finally here, sitting in my officetel and writing this blog post as I have the SBS channel running on the TV, it strangely still doesn’t feel completely real to me yet. Like I’m in some kind of (very) realistic dream. But the feeling I felt, landing in Seoul and walking through the terminal doors that revealed Korea to me for the very first time — it was a feeling that could not be described with words. I now know what it feels like to have your life-long dream become a reality, and I don’t think I have ever been happier in my entire life. Of course, the dream does not end at the Incheon Airport Terminal. That’s only part of it! There’s still so much to discover in Seoul and in South Korea, and I’m extremely excited to be sharing my experience and adventures with you all. I’m excited to live out my Korean dream for the next four months, and experience more personal growth as I represent Drexel, Philadelphia, and the US at the #1 university in Korea, SNU! Thanks for taking the time to read my first blog post, and I hope you’ll be back for more. I’ll also be creating a new YouTube channel to upload vlogs about my SNU experience, so please look forward to that as well! Until then, annyeongheekaseyo — goodbye! 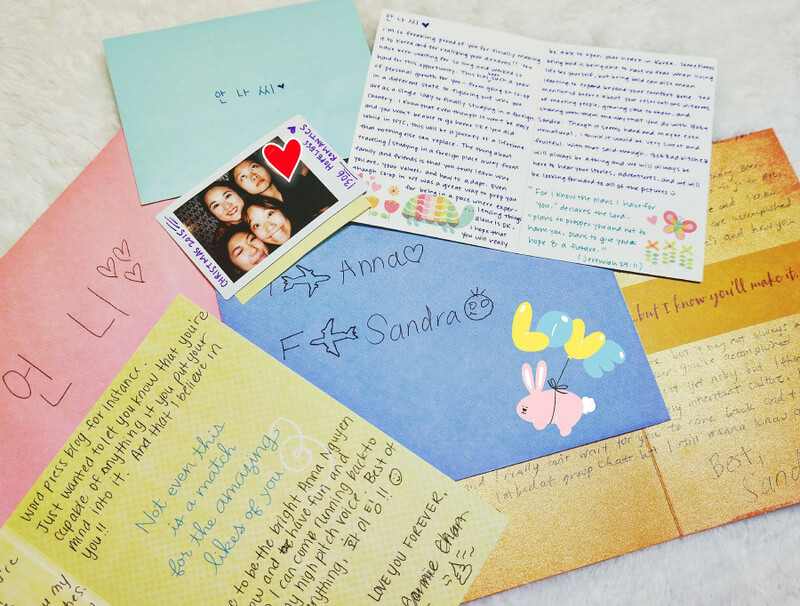 Farewell letters from my closest girlfriends, wishing me luck in Korea! Thank you Carmen, Yvonne, Sandra! Previous: Previous post: Caribbean Vibes! Next: Next post: Across the border!